Will and Matt aka The Young Sequoias are back to showcase a lively set of tunes creating a kickin’ sound with wailin’ harmonica, fingerpicking guitar and drums. Join us for some fine whiskey and brews , sit back and enjoy a wild range of roots and blues. Oliver Kabbani is an acoustic blues purist, playing his way through the 1920's Mississippi Delta all the way to the 1940's of Chicago. Good times and Great Blues. Come join local SA foot stomping blues hero Jimmy Bay as he brings his soulful vibes to our soulful bar. Jimmy Bay is a true artist and will set the tone to an awesome night, so escape the cold, grab a whisky & stout and listen to some local music with us. Situated in Wexford, 20 year old twins Brandon and Ashley combine to create The Ocelots. They have crafted their songwriting and musical experience together to produce a forceful blend of rich harmonies and bare, raw acoustic folk. Their music perfectly embodies the breezy effortlessness of early Bob Dylan, and Simon & Garfunkel. During the 2018 summer festival season The Ocelots performed all across Ireland, UK and mainland Europe and also toured with acts such as Jack Johnson, Glen Hansard, Hudson Taylor and Isaac Gracie. Since then they have been back in the studio working on their next EP which will be released in 2019. This their first tour of Australia will include their new material as well as showcasing the first single of the forthcoming EP. The Ocelots live set combines all that is great about live folk music, so come and be charmed by the charismatic duo. Aidan J Jones and Frets Patrick team up for a night of foot stomping melodies, hot rags and tasty blues. Be transported back in time with Jones’s brand of forest-folk protest blues and Frets Patrick’s traditional ragtime blues. A great night for lovers of acoustic blues and folk music. Aidan J Jones is a multi-instrumentalist folk musician from the Adelaide Hills. Born from busking street corners & back alleys, Aidan J Jones' one-man band is a performance not to be missed. With a sound that carries a unique blend of new-world tales and old-time rag, his songs dance upon the unbroken traditions of folk music. Frets Patrick discovered the music of Blind Wille Johnson in his late teens and become obsessed with early roots music. With influences ranging from Leadbelly to Jelly Roll Morton, Frets Patrick serves up a gumbo of fresh blues, gospel and folk with no artificial colours or flavours. Come and watch Multi-award winning blues singer/songwriter, Cal Williams Jr tear it up on the NOLA stage. His music style has as much character as the walls. Come down, grab a few whiskeys and listen to 3 hours of this local legend. With a certain raspy-innocence to her vocals, Australian singer-songwriter Tasha Zappala unlocks a raw mixture of post-folk blues that synthesizes the atmosphere of a local coffee shop where the lighting is warm & the ambiance is nothing short of enticing. Her intense gypsy-folk melodies will at one moment materialize into dainty falsettos, and at the next into a throaty, growling chest tone. An edge and a gritty presence, Zappala weaves abstracted tales of foggy memories and days adrift. Melbourne’s blues legend Boadz is making the trek over to the south to bless us with some of his silky silky blues. Comes soak up some summer sun and listen to Boadz only Adelaide blues set. Anthony Callisto creates a captivating musical landscape. Moving through soulful, garage-pop to darker, acoustic rhythms, the singer-songwriter will be performing a solo set of originals and songs that inspire. Trav Collins is a 20 year old Adelaide multi-instrumentalist singer/songwriter who has a unique sound, incorporating acoustic guitar with unorthodox electric tones and effects. Accompanying himself with a didgeridoo and harmonica, his solo music has the fullest sound possible whilst still maintaining an acoustic feel. His first album released in March 2018 is inspired by stories, views and experiences from his life so far. For two nights only, NOLA is excited to be hosting Herb Armstrong. 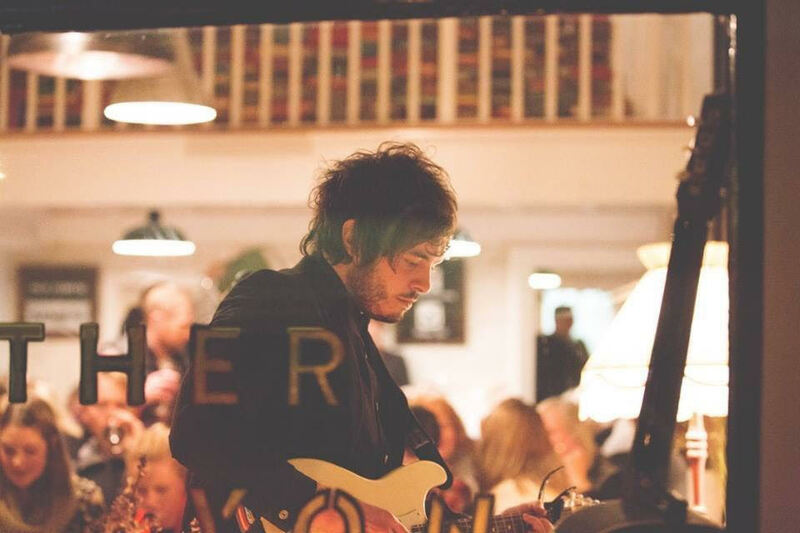 Come in and warm up with his soulful sounds. Herb is the grandson of the famous New Orleans singer songwriter Louis Armstrong. Herb Armstrong is truly larger than life. He is a big man with an even bigger voice. Born and bred in New Orleans, Herb lived the dream of performing the famous Bourbon St and French Quarter clubs as a daily reality. Sharing stages with Bobby Womack, Missy Elliot and the Neville Brothers, Herb has performed in US, Canada and Australia. He now resides in Brisbane. Herb performs the music and memories of his grandfather, the late great Louis Armstrong and the infectious Zydeco and Second Line grooves in an interactive floor show. This is a man with heart and soul who can rock any crowd with his deep voice and larger-than-life presence. A bluesman at heart, avid wanderer reflecting troubadour tradition, albeit delicately picked ballads to foot stomping slide guitar driven downhome blues swagger. Melbourne singer-songwriter & guitarist Matt Katsis features a one-human-band approach through percussive elements of the acoustic guitar, kick drum, stompbox and tambourine, this has seen Matt take to audiences far and wide with the ease and merit that parallel’s his music. His latest EP release ‘As The River Runs’ encompasses his distinctive fusion of folk, blues and roots, which was inspired by his travels through North America's West & The Deep South. Catch him for a Sunday Session Feb 24th Live at NOLA ! Listen up jive turkeys... Our weekly Thursday night brews and blues returns with the Chelsea Lee Smart Trio! You got to sass it over a few Thursday thirst-quenchers. See you here! The Chelsea Lee Trio features award-winning jazz vocalist Chelsea Lee, exceptional award-winning trumpeter Luke White, New York guitarist Nick Pennington, with a new group comprised of old friends and lush music. Ross McHenry is a true local Jazz talent. Having performed around this work in festivals such as Glastonbury, he is a leader in the local jazz scene. Ross McHenry is a composer, bass player and record producer whose work forms a part of the ongoing international discourse on creative improvised music, its history and it’s future. His original compositions encompass a broad range of styles including jazz, afrobeat, contemporary electronic and sample based music. Come escape the heat and support local. Will and Matt aka Billy The Tree & The Woodsman are back to showcase a lively set of tunes creating a kickin’ sound with wailin’ harmonica, fingerpicking guitar and drums. Join us for some fine whiskey and brews , sit back and enjoy a wild range of roots and blues. Come and watch Multi-award winning blues singer/songwriter, Cal Williams Jr tear it up on the NOLA stage on this birthday. His music style has as much character as the walls. Come down, grab a few whiskeys and listen to 3 hours of the local legend. Hailing from the fertile hillsides of Bull Creek, South Australia is the traditional folk-country duo MT KAZOO. Join Declan Casley-Smith and Ben Sargent as they perform their orginal songs as well as a selection of folk standards from both sides of the Atlantic.